It’s an exciting time for bikesharing. Bikesharing is popping up around all over the world, growing at an exponential rate. In 2013, there were 700,000 public-use bikes worldwide compared to 2.3 million as of 2016 (Bernard, 2018). Bikeshare business models are becoming more sophisticated and improving; in particular, there has been a rise of EVs and supporting technology for these types of bikes rise of EVs (movmi, 2018). Other bikeshares are taking lessons learned from previous business models such as dockless to ‘locked to’. movmi is excited to see the growth in this market and hear from entrepreneurs and organizations who are aspiring to launch their own bikeshare. Thus, we decided to map out a step-by-step plan for those who are thinking of starting a bikeshare program to get them started in the right directions. Which city officials do we need support from? How will we obtain sponsorship? On a continuous basis? What types of grants are out there to help support us? Bikeshare programs can be owned and operator by different parties such as the government, universities, private companies or a mixture of both. Since bikesharing is typically not a profitable operation on its own, with capital costs tallying up to $5,000 per bike (DeMaio, 2011), it is necessary to gain the support of others. Support can come in the form of strategic partnerships, sponsorships, or grants. The most important partnership you can make is to develop one with the city. Aspiring bikeshare operators need to engage with officials and educate them about the benefits of bikesharing and how it contributes to the community. Bikeshare programs can be a great way to provide social equity among communities while also being an environmentally friendly option. The good news is that cities are recognizing bikesharing as a form of public transportation, as demonstrated by Washington, D.C. and New York (Jaffe, 2014). It would also be wise to seek out other partnerships. Engaging with local companies and communities would raise awareness among the public. It is also common for bikeshares to have title corporate sponsors to support their operation. For example, Citigroup spent US $41 million to be Citi Bike’s lead sponsor for six years (Wikipedia, 2018). By the end of this step, you will have defined your ownership model and hopefully have the backing of the City. What goal are we trying to achieve with bikesharing? How will this bikesharing program impact the community economically, socially and politically? How will we know our operations are running smoothly? What type of riders will we primarily target? What is our pricing model? How will we use our pricing model to attract various types of riders? How will people hear about our service? Choose carefully the type of service model you want to offer. There are pros and cons to each one. Docked bikeshares were the original type of service model for decades. Riders would pick up a bike at a specific location and get the attendant to give them access or, nowadays, self-serve via cellphone or RFID card. The major con with this type of model is that it can be a hassle for members to find an available docking station that is nearby to their desired end destination. To counteract this drawback of docked bikesharing, there has been a huge investment influx for dockless bikeshares (CBInsights, 2018). In dockless schemes, a geofenced area is determined and people can drop off their bike anywhere in the area. Since there are many bikes in this zone, a person can find one relatively close-by. In theory, the benefit of dockless bikeshares is to provide the ultimate convenience for people. However, in practice it can be a nightmare. 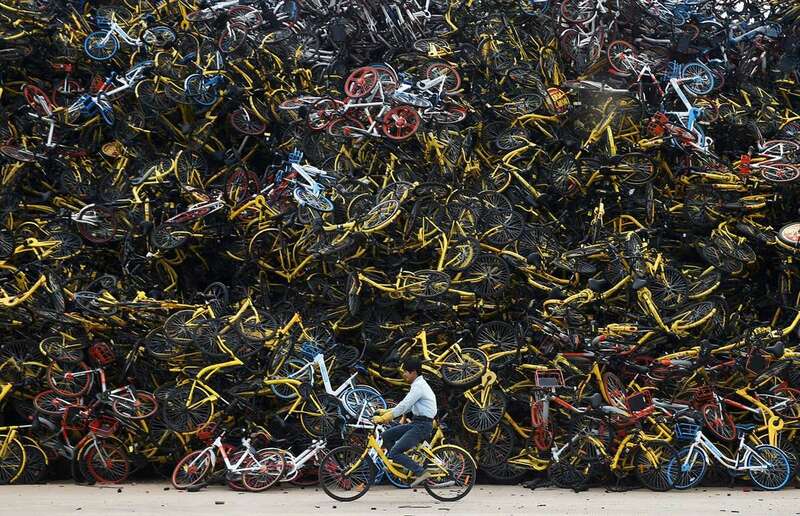 In China, there’s an oversupply resulting in piles of abandoned and broken bicycles (Taylor, 2018). People are referring these to as bike share graveyards. The picture below depicts how big the problem is. Source: Yibo Wang. Shutterstock. 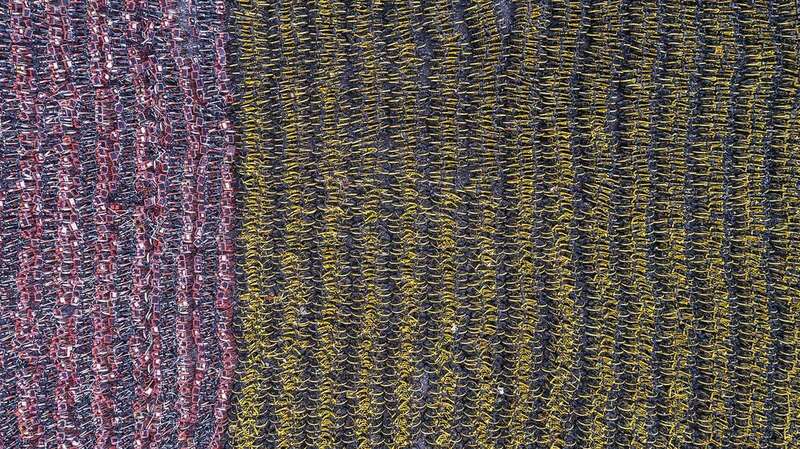 A picture showing thousands of unused shared bikes in a field near Shanghai. To prevent this stockpile of abandoned bikes from occurring, a new service model has been introduced – the ‘locked to’ model (CityLab, 2018). Under this scheme, people must lock their bikes to a bike rack or pole. Companies such as Pace, Zagster, and Jump are following this model. Some bikes already have a built-in cable locks or U-locks on their bikes (movmi, 2018). Another aspect to consider for your business model is if you want to use electric powered ones or pedal assisted. This should be taken heavily into consideration if you are launching in a city that is hilly. Since there are various types of bikeshare users, the pricing plan should reflect this. Day passes will be useful for tourists and offering 3-month, 6-month or annual passes will attract locals. Typically, the first 30 minutes of riding is free, and a small fee is charged for any time used afterwards. movmi recommends performing market research with A/B testing to see what the optimal price is for various users. All your efforts could go to fruition if no one knows about your service. While there are some standard ways of marketing, we recommend working with local companies that share similar values to your service to cross-promote, attend events and setup a booth explaining your service and doing lunch & learns with businesses and its employees. Setting up a trial period with free or discounted pricing will be eye-catching for people. Messaging of your service should be clear, simple and to-the-point. We recommend hiring a dedicated marketing manager and marketing coordinator at a minimum to get your company started. How will the docking station look? Which bikes will you use and how long is the procurement cycle? What is the strategy to relocate bikes? When starting out a bikeshare, start out in the denser areas and slowly expand out as the ridership grows and gains traction. When mapping out your service area, a rule of thumb is to have 10-30 bikes per 1,000 residents. If you’re using a docked system, securing locations and building stations will be one of the most capital intensive and time-consuming activities you will be doing. This is where strategically lining up with a public transportation agency will be beneficial as you can work with transportation planners to identify ideal biking stations. Negotiating for space and obtaining the right permits will take time so be sure to start this well in advance. While this affects docked and dockless bikeshares, relocating the bikes will be a key operational task. At this stage, you should map out a strategy as to who will be relocating the bikes. Will it be a third-party vendor? Or will you crowd-source it like Bird does? How much are our capital expenditures? What’s our projected revenue and operating costs for the first 3-5 years? How we will raise the desired amount of money? It is imperative that you design a financial model ahead of time to understand how much it is going to cost you to setup a bikeshare operation and how much you will need to continuously raise when your program operates. Bikeshares are not sustainable on their own – the operational revenue does not cover the operational costs. movmi recommends projecting the first 5 years of operations to assess your financial needs. To get a sense of how much capital and operating funds are required, movmi looked at how much capital spending previous bikeshares used to launch their operations. Based on the examples below we can see that “it typically costs $4,000 to $5,000 per bike to launch, which also [includes] the cost of docking stations and kiosks” (Beitsch, 2016). Rochester Area Bike Sharing Program required “$2.5 to $5 million over 5 years for capital and $3.3 million of operational funding” (Toole Design Group & SRF Associates, 2015). According to Russell Meddin, the founder of Bike Share Philadelphia, In Birmingham, Alabama, the federal transportation agency granted the bikeshare $1.6 million dollars and raised $2.2. million from other key sponsors such as Regions Bank, Blue Cross Blue Shield of Alabama and Alabama Power Foundation (Beitsch, 2016). To offset capital and operational costs, “Citigroup pledged $41 million to underwrite the city’s bike sharing program for five years” (Beitsch, 2016) in New York. In Washington D.C., the bikeshare program has a shortfall of 23% (Beitsch, 2016), despite operating at 3,000 bikes and have been in operations for 6 years. In Boulder, riders only cover 35% of the system costs. As we can see, there’s a significant amount of capital that is needed to launch and operate a bikeshare. Ridership alone will not sustain the operations and the support of various stakeholders will be required. Now that you’ve strategized about what your service offering will be and gained support from private and public stakeholders, it’s time to create a project plan! 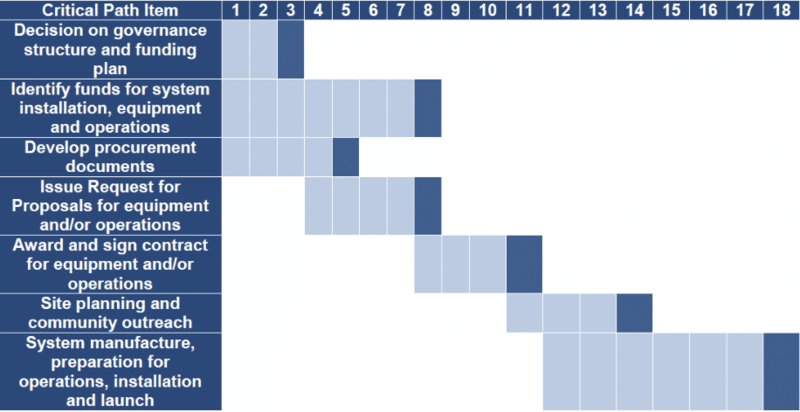 Assess who is doing what and when and map out any activities that are dependent on one another. Source: Baton Rouge Area Foundation. Bike Share Business and Implementation Plan. City of Baton Rouge. 2016. If your bikeshare is suffering from low ridership, there are many reasons why this could be happening. If you are suffering low ridership soon after you launch your services, perhaps it’s because there is little awareness about the new service. Or perhaps the price is set too high which deters people from using the service. If pricing is an issue, consider changing your pricing plan (perhaps offer an additional subscription package that addresses the concerns of certain demographic). Also, if no trial period is offered this may result in low ridership because people need to ‘test out’ a service before feeling comfortable to commit. Other causes for low ridership revolve around location (and density), climate and proximity to other transportation modes. To sum, there are many reasons why ridership could be low and thus it important to identify what the problem is and then once you understand that, you can identify how to solve it. Fortunately, studies have shown that the majority of bikeshares experience few thefts and vandalism, some as little as 0.5% (Lazo, 2017). For example, Capital Bikeshare lost 60 of its 4,100 bikes to theft and in Philadelphia, only 50 were lost with a fleet of 1,200 bicycles. That said, it could still be a significant problem depending on the city. In Paris, over 80% of the 20,600 Velib bikes were stolen or damaged two years into the program” (Lazo, 2017). In Baltimore, the amount of thefts were so significant that is shut down operations for a period of time to regroup and implement new security measures (Lazo, 2017). To mitigate theft, bikeshares should equip each bike with locks, such as U-locks. As well, current operators have seen less theft at stations with surveillance cameras and well-lit areas (Lazo, 2017). Thus, when planning out where to have your stations you should take this into consideration. It’s also important to have a good working relationship with police (Lazo, 2017). It may be beneficial to talk to public transportation planners to help you decide where the best stations are that experience low levels of thefts or strategies to mitigate it. As mentioned in Step 5, it can be expected there will be a significant operating shortfall of 25-65%. Of all the common problems a bikeshare program can face, the operating shortfall will be the most prominent one you should focus on. This will require support from multiple stakeholders including political and corporate sponsors. Bikesharing is one of the best shared mobility options when it comes to providing convenience to end-users and doing it in an environmentally-friendly way. While the goal of bikesharing is noble, it requires a significant amount of effort and capital to operate successfully. Trip revenue doesn’t cover the operational costs which makes it imperative to team up with various stakeholders to ensure the livelihood of the service. Deciding on your service model will influence the types of operational pain-points you’ll incur. What is exciting though, is that as the bikesharing industry grows, innovations to improve the member experience have come along with it as well. We’ve broken out the major steps you need to do to launch a bikeshare but there’s more to it than just that. Identifying your unique selling proposition, creating the right pricing strategy, and executing the operational framework so you have the right stations with the right amount of bikes at the right time can be hard to do right the first time. If you want more assistance, check out movmi’s Playbook or our competitive benchmarking services to see how our services could help you. Baton Rouge Area Foundation. Bike Share Business and Implementation Plan. City of Baton Rouge. 2016. Bernard, Z. The bike-sharing economy is shaking up the transportation market worldwide. Citylab. Chicago’s South Side Get Dockless Bikeshare. 2018. DeMaio, P. Five Things Every Major Should Know Before Starting a Bike Sharing Program. Jaffe, E. The Most Persuasive Evidence Yet that Bike-Share Serves as Public Transit. 2014. Lorenz, T. Electric Scooter Charger Culture is Out of Control. 2018. The Atlantic. movmi. Bikesharing 2018 Update: New Companies and Technologies. 2018. Toole Design Group & SRF Associates. Rochester Area Bike Sharing Program Study. 2018.